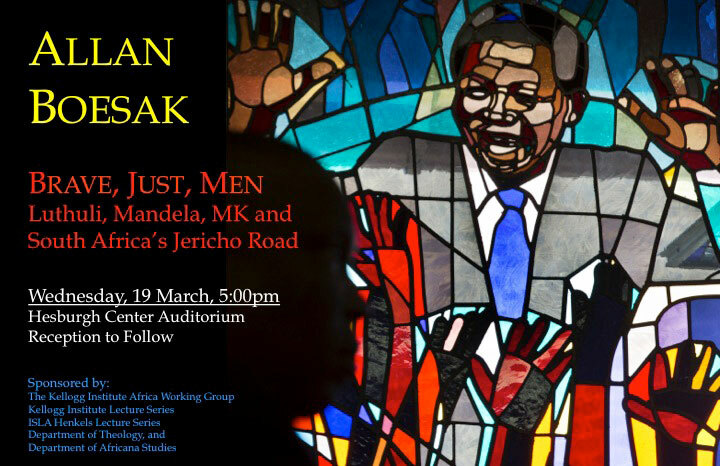 Two prominent South African participants in the anti-apartheid struggle will speak at the University of Notre Dame on Wednesday (March 19) and April 3 (Thursday) as part of the Africa Working Group’s “Celebrating Nelson Mandela” series. One a liberation theologian and political activist, the other the “Jackie Robinson of South Africa,” they each played a crucial role in moving their nation out of apartheid. Funded by the Kellogg Institute for International Studies, the Africa Working Group provides a forum for Notre Dame faculty, graduate students and outside scholars to present and discuss cutting-edge research on Africa. Participants from a range of disciplines share a common interest in investigating Africa’s past, present and future, as well as Africa’s place in the larger global order. “There are many great statesmen, but Mandela was the only person who could make trust, forgiveness and hope a seductive prospect to absolutely everyone he met. His gift was not to call a perceived enemy over to his side, but to cross that line himself, put his arm around his adversary and walk with him,” said Bolten.